It’s income report time again! Each month Donnie crunches the numbers and analyzes what went well and what we could improve with this little bloggy business of ours. To be honest, it’s kind of a nerve-wracking thing to put everything out there–eeek! We definitely don’t do it to say, “Hey, look at us!” but rather because we love blogging and are passionate about helping others who love it too. 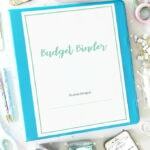 I have learned so much from other bloggers who have been willing to be transparent about their businesses, and our hope is that these monthly reports/analysis are helpful to others who want to grow their blogs as well. The month after a launch always makes me especially nervous because launch months tend to have higher numbers, so the next month, a tumble in numbers is pretty much inevitable. Though July’s totals did end up quite a bit lower than our record month in June, they are higher than I anticipated, and I was still thrilled with how the month turned out! Fizzle.co – $0 (usually $35) – This is the community where we learn about online business and connect with other entrepreneurs. Abby and I took the month of July off. Well, sort of… obviously there is still quite a bit of ongoing blog stuff to keep up with, but thanks to a fantastic group of guest posters, we were able to step back from the content creation end of things for a few weeks to take a couple of trips and get some work done behind the scenes. In mid-July Abby traveled to Atlanta to attend the Haven Blogging Conference. It was a much needed time of socializing and connecting with other bloggers. The boys and I stayed home in Pittsburgh and had a lot of fun too! Our family spent the last week of July on vacation in Jekyll Island, GA. It was my first time to the Georgia coast, and I thought Jekyll Island was spectacular. Well off the beaten path, there were no crowds, no waits, and no traffic– just miles and miles of remote beaches and historical southern charm. I’m not big on crowds (drop me off in the woods instead of an amusement park or shopping mall!) so the island was perfect. I enjoy long car trips (as long as I’m driving), so we chose to drive. Abby got super competitive if not a little obsessed with the license plate game. By the end of vacation I think she ended up with 40/50. I almost wrecked when she screamed at the top of her lungs after spotting an Alaska plate. She’s crazy. In between Haven, vacation, and other summer fun I spent a lot of time working on our kitchen reno. As with any big remodel, there have been some challenging times when nothing seems to go right. We’re pushing through, though! Fortunately (for our family’s sanity) we’re in the home stretch. We can’t wait to start sharing all of the steps of the process with you! This month Abby was a guest on one of the top business podcasts out there, Entrepreneur on Fire! She’ll tell you she was nervous about the interview but I think she did fantastic! You can find the episode here. It’s a must listen! 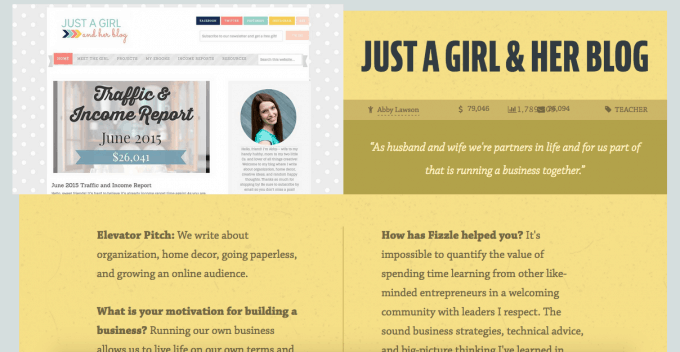 Just a Girl and Her Blog was also featured on the Fizzle.co Sparkline Blog as one of the 25 Up-And-Coming Indie Entrepreneurs to Watch in 2015. It was fun being a part of that list! I really can’t say enough about the business training at Fizzle.co. I’ve been a member since they opened their doors in 2013 and I spend a lot of time watching their training videos and participating in their private online forum. It’s given me so many amazing business and marketing ideas. Framework income remained strong in July. We didn’t implement any new marketing plans but we have some systems automated that should continue to drive future sales. We already have plans to continue adding additional interviews and video tutorials. More on that in a minute! The Paperless Home eBook and course came in at #3 this month! That’s exciting because it had felt like sales were starting to drop off. 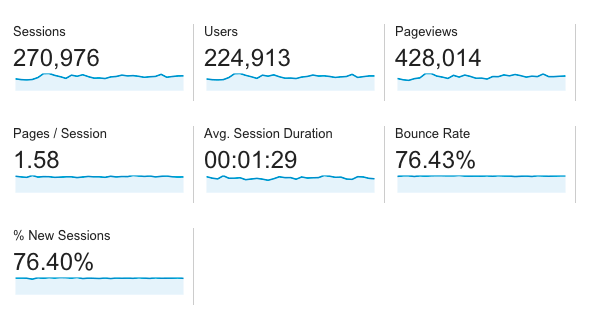 Quite a few sales come from the blog posts at DonnieLaw.com, but I haven’t posted anything new there in over a month. As readers request a free sample chapter of the book from various forms on this blog as well as mine, they start to receive an educational series of emails from me. The series of emails ultimately turns into sales. It’s nice that once I have these systems in place it all happens somewhat automatically. This is one of the many, many reasons we are always preaching, “GROW YOUR EMAIL LIST!” As you can see, we were able to <mostly> take the month of July off yet still have a strong month with our product sales because of email systems that we have in place to automatically run for us. So when we’re at the beach or at a conference or playing with our kids, our email marketing strategy is working hard and driving sales and we can enjoy ourselves. If you’re not working hard to grow your list, start today! 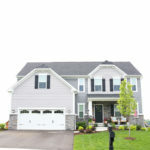 Along with the continuation of our email strategy, as the school year starts and Abby and I get back into a somewhat normal routine, we’ll have some great opportunities to write more about organization and going paperless which ultimately should increase The Paperless Home sales as well as Simplify sales. An interesting thing happened in July for The Paperless Home… we added our first ever affiliate! In July Gumroad rolled out their integrated affiliate management system, so I thought we’d give it a test drive– I was really impressed! I can’t say enough how much I like using Gumroad to sell and deliver digital products. It doesn’t do everything, but what it does, it does better than any other service. Earlier this year Gumroad added a PayPal payment option, and in the past month they rolled out affiliate support. This much-requested feature is a game changer for a lot of people! The differences between this affiliate management system and the SendOwl system we use for Building a Framework is significant. With SendOwl I have much more control over affiliate terms, payment, and other details. But this comes with a cost of time and complexity. I have to pay each affiliate manually out of our earnings at the end of each month. It’s not particularly difficult to do this with PayPal, but it does take time. With Gumroad, they take care of everything. The affiliates are paid directly from Gumroad so there is literally nothing I have to do once the affiliate account has been created. If the affiliate has some type of issue with receiving their commission or checking their stats, they contact Gumroad directly. I much prefer this setup. The only manual work that is done with the Gumroad system is actually adding affiliates. Some would see this as a negative, but I like it because it allows you to be selective and personally review potential affiliates. To give you an example on why this may matter, Abby and I have about 300 affiliates for Framework, but each month I send payments to less than 20. Many people sign up for affiliate programs but never do any marketing or make any sales. 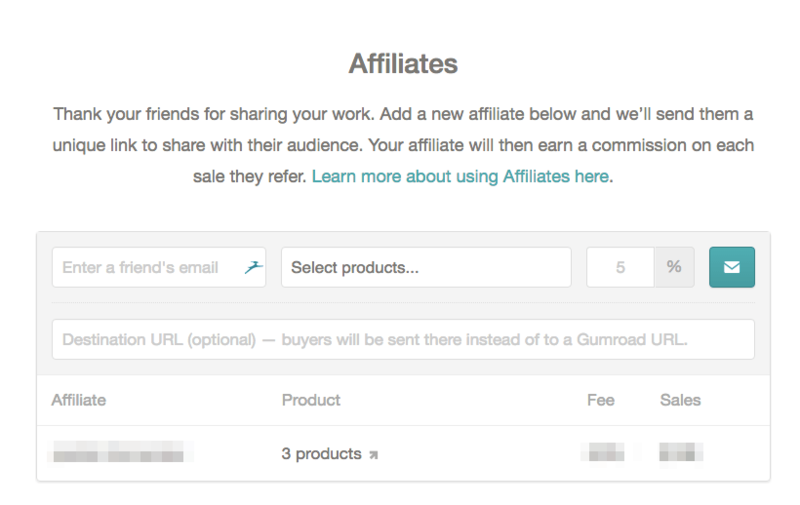 Because adding affiliates with Gumroad is a manual process, it forces you to be selective. I’ll review the requests and accept them on a case-by-case basis. Ebook affiliate partnerships can be a phenomenal opportunity– if you go back and look at our past income reports you’ll see that Abby and I have made thousands over the past year and half as an affiliate for Evernote Essentials. 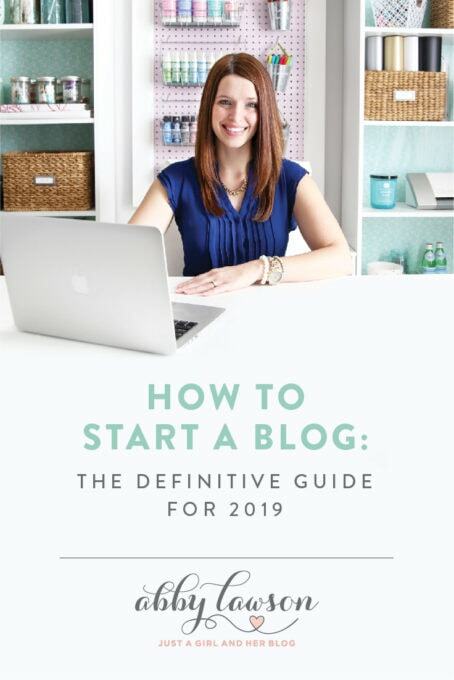 Finding a product that connects with your readers and becoming an affiliate is one of the best ways to start earning an income from your blog. 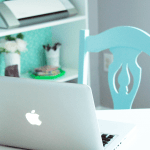 If you’re interested in becoming a Paperless Home affiliate partner, I’d love to hear from you. 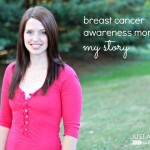 At some point in June Abby and I made the decision to remove the top banner ad from the blog. If you remember, we handed off the management of our ads to AdThrive last fall, and it was one of the better business decisions we’ve made. They take a very small cut of the ad revenue, but in return we have experts managing our ads. I guarantee you that we end up making more with this arrangement than if I was trying to cobble things together myself. It’s now almost completely hands off for us. Andy and Kelly run a cutting edge ad company with great customer support. We highly recommend them! As much as we love AdThrive, we made the decision to minimize the ad presence on our blog. Why? I think ads can potentially be distracting to the reader. With our Restored 316 theme, using that top leaderboard pushes the rest of the content on the page down. That means all of the post previews as well as the picture of Abby on the sidebar slide down by 90 pixels or so. Without the top banner, I think the site looks better and visitors can more easily see what they came for — the blog posts. Removing the leaderboard has affected our ad revenue. Our CPM is now lower; I estimate that we are losing $200-$300 per month with our current traffic. Because ad revenue isn’t our only income source, I think the improved reader experience is worth the tradeoff. To be honest, we’ve thought about removing ads altogether. But right now the $1,000 or so each month we receive from ads is important to us and still a substantial revenue stream. Over the next year you may see us adjust ad placement, but we have no immediate plans of phasing out ads entirely. I do want to clarify something with our expense reporting each month… You’ll notice that I didn’t include any travel-related expenses for Abby’s trip to Haven Conference. I debated how I should handle those infrequent business expenses like travel, camera equipment, computer equipment, etc. To simplify these income reports I’ve decided not include those non-regular expenses where there are potential deductions or partial deductions. So in full transparency these reports are not identical to what I file with the IRS (shocker!). Small business accounting, especially online business accounting, can be complicated. In fact, it’s one of the areas where we receive the most questions! For that reason, this month we released another Framework Master Package Expert Interview with accountant and business owner Sarah Korhnak. 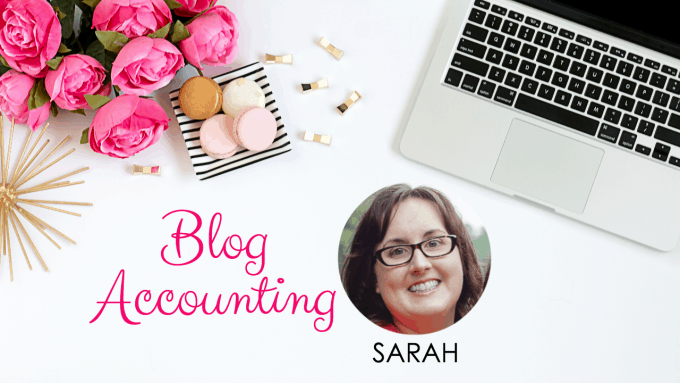 Since Sarah is a blogger and an accountant, so she truly understands the unique circumstances that surround taxes and blogging. This interview has already been watched by the Framework audience over and over again and has proven to be helpful for SO many people. If you have the Master Package of Building a Framework, definitely don’t miss this video! Whew, that was a lot of info for a month we took “off”! 😉 Thank you guys again for the support that you give to this blog of ours month after month. We truly feel so blessed to not only do this for a living, but to have to chance to connect with so many other people who share the same passion for blogging and online business as we do. It is truly a unique and AWESOME community to be a part of, so thank you, thank you, thank you for being your amazing selves! Have a wonderful week! This is a very insightful post. It really encourages me to enjoy this new adventure in blogging. My favourite post of the month! Thank you so much for the explanation and teaching in each one – they obviously take a lot of time to put together. 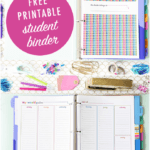 I’ve been inspired to publish them too… as soon as I start to make an income that is! 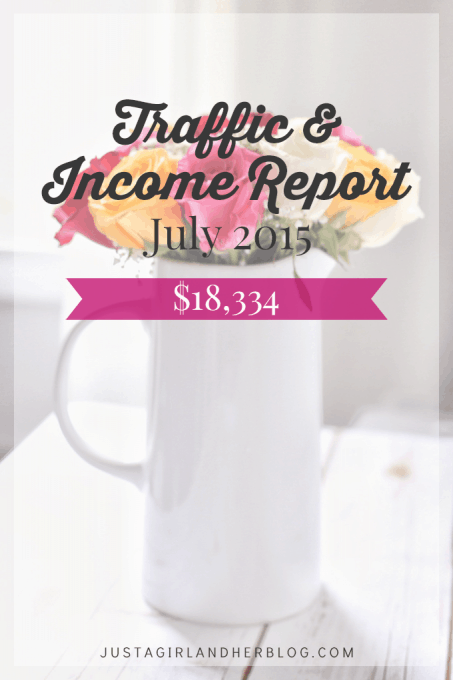 Thank you so much for sharing your income reports! As a fellow blogger I love reading them to get ideas on how to make more of a profit on my website as well. Congrats on yet another awesome month! 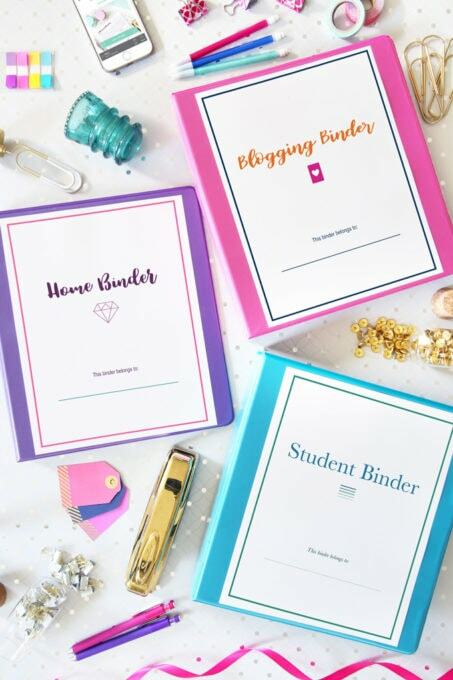 You’re such an inspiration for those of us trying to turn our blogs into a business. I even started doing my own (extremely humble!) income reports this summer to document my journey. You sharing yours made me brave enough to share mine too! Even though it’s not very impressive right now, everyone has to start somewhere, right? 🙂 Keep up the great work you two! It is hard not to compare, but to my defense, I am doing incredibly better if compared with last year’s performance (791% to be exact => no, it is not a typo). You guys do an amazing job and hard work pays off. Thank you so much for the information and support you provide (I love Building a Framework). Abby, good job for the month of July. I made the decision as well not to have a banner ad at the top of my blog. My header is a bit large anyway. I always enjoy yours and Donnie’s tips and advice. Blessings! This is so interesting to see how your business keeps working behind the scenes even when you took the month “off.” I was really curious to see how you guys did and was just as surprised to see the numbers. It’s really encouraging (and fascinating!) to watch you guys grow and experiment. I’m glad you took the top banner off. I know it results in a loss but it does look so much better. I’ve never been a fan of those. 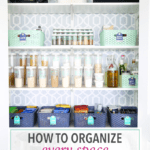 Great post with so many helpful tips! I loved your interview on EOFire, Abby. You did a great job! So genuine and honest. EOFire is my favorite podcast and I’m glad to have found you through it! Thank you so much, Brittany! So nice to “meet” you! 🙂 Popping over to check out your blog now! Have a wonderful week! Holy cow! I love your bluehost income. I finally had my first bluehost income this month. Im so excited!! 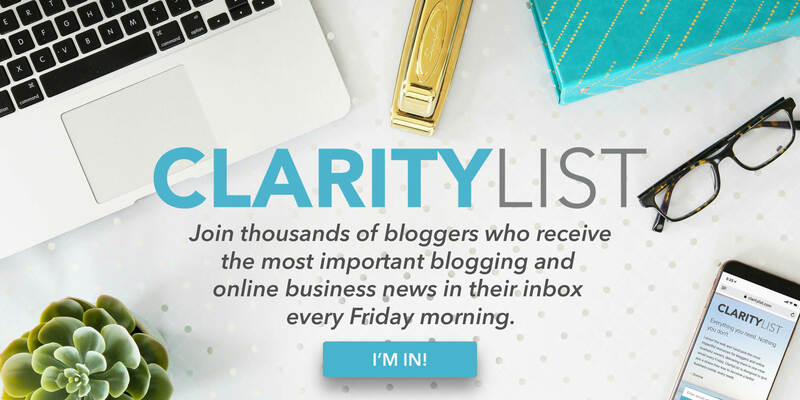 I have officially updated you on the The Ultimate List of Blogger Incomes! Yay! I read over the top 1/2 or so of this posting. I think it’s awesome you share your revenue and costs not only so others can learn from it but just because it’s an ethical thing to do. It’s difficult to articulate, but basically I’m trying to say that the more transparency we have in the world, the more we can trust each other. Too often businesses and organizations choose not to share certain information for fear that they will be criticized and have to change (at least that’s my guess). I would much rather live in a world where info is available and people are open about money. And Abby, I like that comeback… he married you… so who’s the crazy one 😉 I remind Chris of that too! Congrats on the success you guys! Also, good move on removing the top banner ad.. your website looks so fresh and nice! By the way, just listened to the EOF podcast.. great job!! Learned a lot and it was inspiring. Thanks so much for sharing all this information. 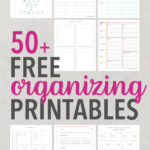 I’m in the process of attempting to go paperless…and with two home-based businesses and 30+ years of stuff, it’s quite a process. Anyway, my question for you is can you give me a brief difference between your book The Paperless Home and the affiliate you also promote, Evernote Essentials? Is there a compelling reason to purchase both? I’m just starting to research Evernote so want to make sure I make the best purchase. Thanks! We started offering Evernote Essentials before we released The Paperless Home. Brett’s book is great but his book doesn’t teach you how to go paperless. His goal is to make you an Evernote Expert. The goal of The Paperless Home is to make you a paperless expert that happens to use Evernote as the primary tool. Awesome results. I missed this one and I think your decision to drop the header banner was spot on. Those banner do distract from your brand. Great job and keep up the good work.